Get away from it all in this beautiful 3 bdr/2 bath log cabin in the heart of the Smokies. One of the most private and peaceful properties in the area. Conveniently located in Maggie Valley, the gateway to the Great Smokey Mountain National Park and a short drive to Asheville, Cherokee, Waynesville and Sylva. Easy access paved state maintained road and paved driveway to the house insures access year round. It is minutes from outdoor adventures in the National park and national forests (Pisgah and Nantahala). Hike among old world forests and raft down the Tuckasegee river. Ski Cataloochee Ski area, 1000 acres, less than 3 miles up the mountain. Asheville is a must while here and only 30 minutes to its street fairs and laid back attitude. Harrah’s Cherokee casino is a few minutes down the road. So much more to do, come stay a while. The cabin is nestled among the hardwoods at 3300 feet. Enjoy the cozy fireplace after your outdoor adventures. Every season is special here! The kitchen is well equipped for the convenience of home cooked meals. A coffee bar is well stocked with samples of locally roasted coffee to start you day off right. If you find the time for watching TV, a 32” flat screen is provided in the living area for ruku internet streaming channels. NEW couches for lounging about. We want your stay to be as comfortable as possible, so we have upgraded all the bedrooms. The upstairs master bedroom features NEW and very comfortable bedding: platform bed with upscale-memory foam/gel mattress, hypoallergenic fluffy pillows, mattress and pillow covers, all season down alternative comforter and duvet and new 800 count cotton blend sheets. The two downstairs bedrooms have also been upgraded. Each with a queen bed, memory foam gel mattresses . There is a full bathroom on each floor with shower/tub. A full laundry room with washer and dryer is located in the downstairs area. Iron and ironing board are available. We recommend an all wheel-drive vehicle in winter. Snow is always a possibility here in winter. Sorry, no weather related refunds after the cancellation period. The cabin has Hugh’s net satellite internet. Due the the rural area in the mountains, the internet can be slow and unreliable. We do not recommend relying on this internet for work ect. ***early 12:00 check in for $50 with pre-approval. 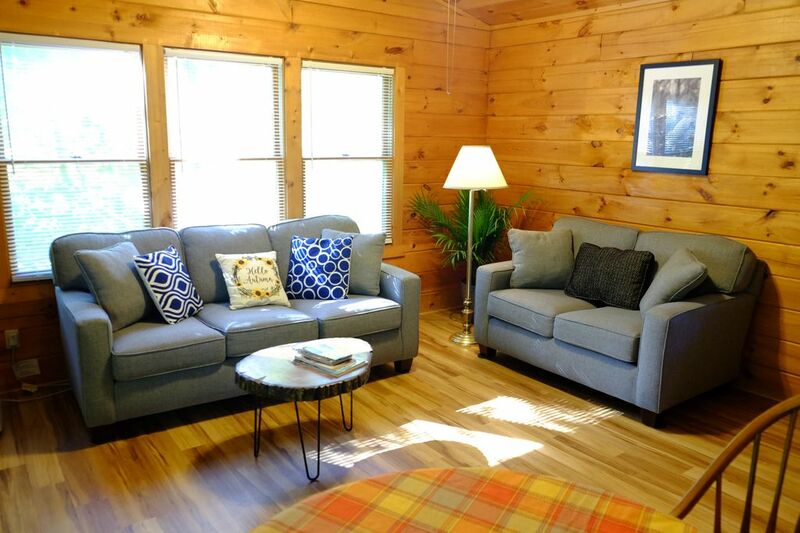 We are so excited to offer our cabin for vacation rental! We are locals and absolutely love our mountains and small town charm. We are very fortunate to call Haywood county our home and never get tired of the natural beauty we are surrounded by. Sharing this place with you is our joy. We are happy to offer insider tips on places to go and things to do. Thanks for a clean and welcoming place to stay for a long weekend. Fun, winding drive up the mountain, two porches for sitting, and well appointed. House was perfect. The house was by itself and not right on top of anyone, the bedrooms we're very clean and the beds we're extremely comfortable. I loved the views from both decks, and the kitchen had everything, definitely be back. Everything was perfect!!!!! Excellent home, I would gladly stay again. very beautiful home and very clean, perfect trip!! Our family of five thouroughly enjoyed our time at the cabin, it was very peaceful and quiet. The cabin was clean and comfortable. Thank you! We enjoyed our stay at this exceptionally clean cabin! The beds were very comfortable. The bathroom and all linens were clean and comfortable. The place looks like it has been well maintained and/or updated. The beds were definitely new! Everything was in good working order. Really enjoyed the stay. Will stay there again! The owners are very easy to connect with for any questions. This cabin is a perfectly located hub for all the fun in the mountains! Do you enjoy natural entertainment? Then this is the place for you. Maggie Valley is the gate way to the Great Smokey Mountain National park. You will be minutes away from enjoying miles of great hiking trails and panoramic vistas. Jump on the Appalachian Trail or Mountains to sea trail. Historic Cataloochee Valley with its well preserved chapel, school, Palmer House and Elk watching in the valley are nearby. Prefer a scenic drive in the mountains? The Blue Ridge Parkway winds through the heart of the Smokeys where your spirit will soar. Be sure to pack you picnic basket. For the adventurous types, how about some snow skiing at Catalochee Ski area? 10000 acres about 4 miles away. The summer is a great time to enjoy river tubing or rafting/kayaking on area rivers. A short drive to Asheville, zip-lining at Navitat is a tree-top adventure. The quaint towns of Maggie Valley, Waynesville, Sylva and Highlands provide lots of shopping at terrific gift shops. You will also enjoy micro-breweries, restaurants and lots of outdoor festivals and blue grass music. Cherokee, NC is a few minutes away. This is the place to go for a unique cultural experience. “Unto these Hills ”outdoor theater, the Cherokee cultural center and Oconolofee village are a must while here. Try your luck at the tables and enjoy fine dining at the Cherokee Harrah’s Casino. Asheville, art deco city and Beer city USA, is just 30 minutes away! Restaurants, breweries, art, shopping, the Biltmore House and the Grove Park are just a few reasons to visit. There is so much more and something for everyone! Come and be our guest, stay a while and enjoy the spirt of these ancient mountains.